For truly extra-large storage needs, the Vinyl Murryhill is your solution for organized storage. 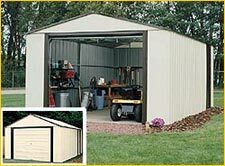 The unique roll-up, garage style door and gable roof blends with a durable vinyl coated exterior steel finish to give you maximum value for your storage dollar! Includes a sliding side door for added access to stored items! Use for storage or as a small workshop or hobby space. Available in six sizes from 12'x10' to 14'x31'. Interior Dimensions: Width: 164" Depth: 370 1/2" Height: 114 1/2"
Door Opening: Width: 106 1/2" Height: 91 3/4"
Recommended Foundation Size: Width: 164" Depth: 370 1/2"